The Remo Pinstripe Standard Drumhead Propack includes 12", 13", and 16" Remo Pinstripe heads with a 14" Powerstroke 3 head. 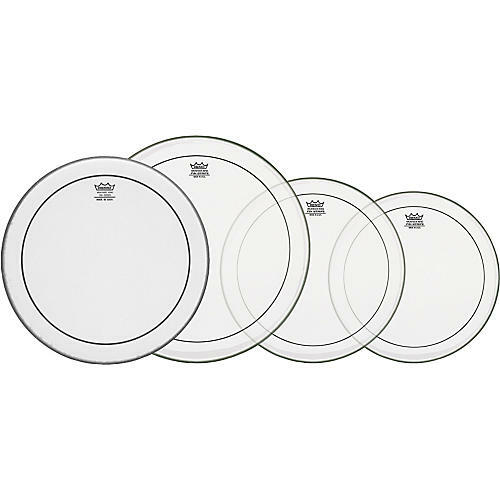 Remo's popular Pinstripe heads are made from two plies of 7-mil Remo clear film and are bonded at the collar to dampen both high overtones and overall resonance. The result is a very focused, low-pitched sound with moderate attack and response characteristics that is ideal for creating a deeper, fatter, controlled drum sound for a variety of studio and live drumming situations. The quick decay of Pinstripes makes them ideal heads for the "fat" sounds of pop, rock and R&B music. Remo's Coated PowerStroke 3 series features a thin underlay at the outer edge of the head to subtly dampen unwanted over-ring. This design creates a near-perfect balance of response and tone control that has quickly made PowerStroke 3 one of Remo's most popular drumhead models.